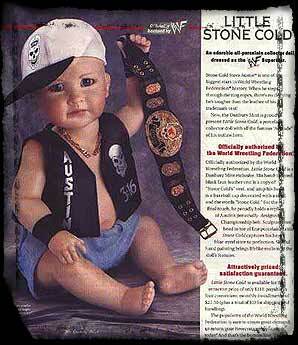 Someone Bought This Classic: Stone Cold Porcelain Baby Doll - WrestleCrap - The Very Worst of Pro Wrestling! From loyal Crapper Romero Superstar: “Baby Stone Cold Steve Austin Porcelin Doll for the bargain price of $110. Endorsed by the World Wrestling Federation, “Satisfaction guaranteed”. RD: You know the saddest part? I actually have readers that HAVE this thing, and ADMIT to having it. You know, if you just have $110 laying around to spend on crap like this, give it to charity or something. 35 Responses to "Someone Bought This Classic: Stone Cold Porcelain Baby Doll"
Babies are creepy enough as it is, but basing one on an alcoholic wife-beater is even creepier. To be fair, he wasn’t a wife-beater at the time. Steve Austin Vs. Creepy Possessed Baby Steve Austin Doll would make for a hell of a good horror movie. No, It would still be Vince mcmahon’s fault. However with this movie, there would have to be some kind of Vince Russo twist at the end. I’m sure Russo would be the writer of this film. I have to agree with RD, I would rather just give the $110 away than buy this piece of junk. Maybe they’re tying to branch out to little old ladies with this. I’m actually the person who entered this ugly, ugly product in to the Someone Bought This article in… 2003 or something like that. Nice to see I’m still a loyal crapper! I bet if they made a John Cena version today, women would buy it. possibly. I think a CM Punk one would be funny with his exact tattoos. someone needs to get on that stat and make a CM Punk Porcelain Baby Doll. Austin 3:16 says I need a diaper change! I always found it funny the WWF had the Big Gold Belt for about four months, before WCW took it back and gave it to the NWA. The NWA pulls out, the WCW turns it into a International Belt. Finally it becomes the WCW title again. I’m kind of baffled that Hogan actually carried around the Big Gold Belt, instead of getting a WWF-like title. Sure it worked for Hollywood Hogan in 1996 to have the Big Gold Belt, but not in 1994. Question: Is Ric Flair the only guy to actually be a champion of another promotion? Flair was stripped of the WCW title, but the paper-NWA had him holding the paper-title during all of those Bobby Heenan promos with the belt. The minute stepped on WWF TV – the NWA stripped him. The WWF kind of recognized him until they gave the title back to WCW. Flair carried around a tag belt for a few weeks, before wearing a bogus Big Gold Belt that fooled nobody. Soon after they just put the WWF Title on him. Meanwhile the Big Gold belt went to WCW, who gave it back to the NWA in 1992. When Flair returned to WCW, Flair even wins the NWA title. Then the NWA pulls out, and Flair fights Rick Rude for the Big Gold Belt. Yep, it took another PPV before WCW created an international board of directors. Because NWA was now a Japanese promotion, and therefore because the NWA pulled out the WCW found their own Japanese backers and . . . (i got a headache). Rude held on to the title until Sting beat him, then Rude won it back and was finished due to injury. Sting then won it back in one last match with Vader, and then jobbed it to Flair – and the Big Gold Belt remained WCW standard. Then Triple H took it over. I think you guys forgot that in the late ’90s, wrestling saturated EVERYTHING! 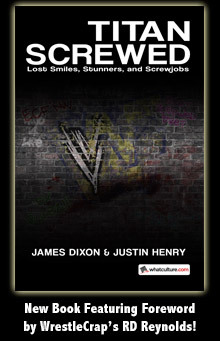 Wrestling T-shirts in Wal-Mart, wrestlers on HSN, wrestlers on MTV, SNL, sitcoms, etc., etc. yeah that is true. They even went as far to start storylines on Mad tv that somehow ended up on the actual show. It could be worse it could have been the actual Baby Doll. At least Duth-tay Rhodes would buy one so Larry Zbyszko wouldn’t open the envelope. My mom actually bought this doll. Of course she’s not a wrestling fan, but she thought it was cute ( her words ) & she collects porcelin dolls, so it wasn’t too far fetched for her to plunk down $110 for this. She thought i would like it as well, considering i’m a huge wrestling fan. I told her no, i have never been more disturbed by something in my life. They also made a Rock doll just like this, complete with raised eyebrow. Look it up, it’s far more disturbing. An dats da bottom wine, cuz goo goo said so. BTW would love to see Gene Snitsky punt this little so-and-so….